I saw a quote the other day that literally felt like it was made for me. It read, ” it’s almost time for me to switch from my regular anxiety to my festive holiday anxiety”. I mean…..could this be any more true right about now? Although the holidays are a season I look forward to every year (and for good reason), they never fail to unleash a different kind of stress and anxiety and busy-ness. I wish I could stop and smell the Christmas trees every once in a while over the holidays, but reality is, the decorating still needs to be done, the family and friends’ parties still need to be attended, the shopping and wrapping needs to get done and the food still needs to be cooked. One day we will have robots for these things and we will be complaining about not being able to do it anymore (le sigh). Anyways, back to the food still needing to be cooked. 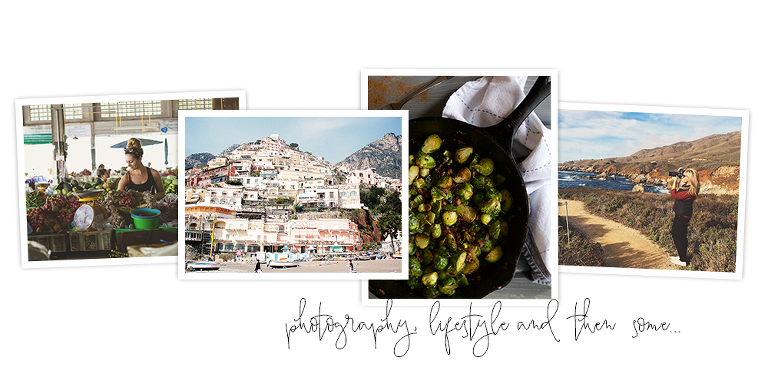 I’ve realized I haven’t posted appetizers much on the blog and I think the holiday season is the perfect time to start. Almost everyone needs a new appetizer idea this time of the year, amiright? I’ve got you covered. 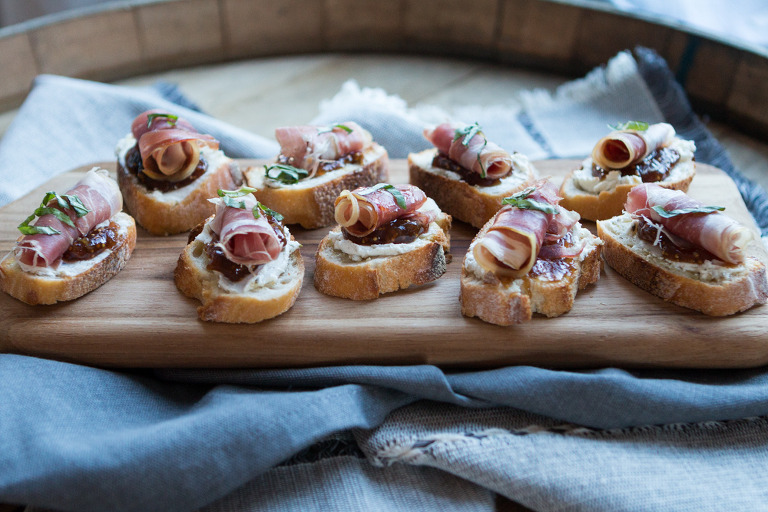 Enter these Prosciutto Crostini’s with Goat Cheese and Fig Jam. Otherwise known as…..your new go-to appetizer recipe. I can’t tell you how often people ask me how to make these. To be honest, I threw this together one year because I liked making paninis with fig jam and prosciutto. See recipe for that goodness here. 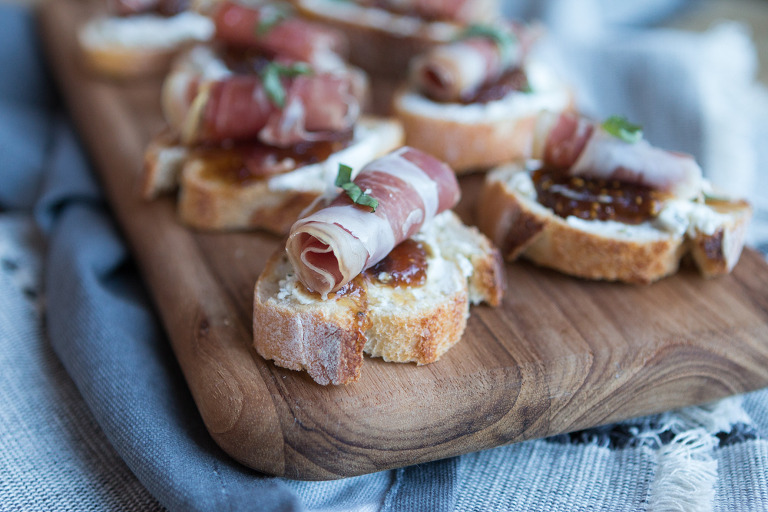 I added this herbed goat cheese that is a personal favorite cheese of mine (it also goes well with soooo many other things) and voila!……the prosciutto crostini’s with goat cheese and fig jam were born. What a beautiful birth it was too. 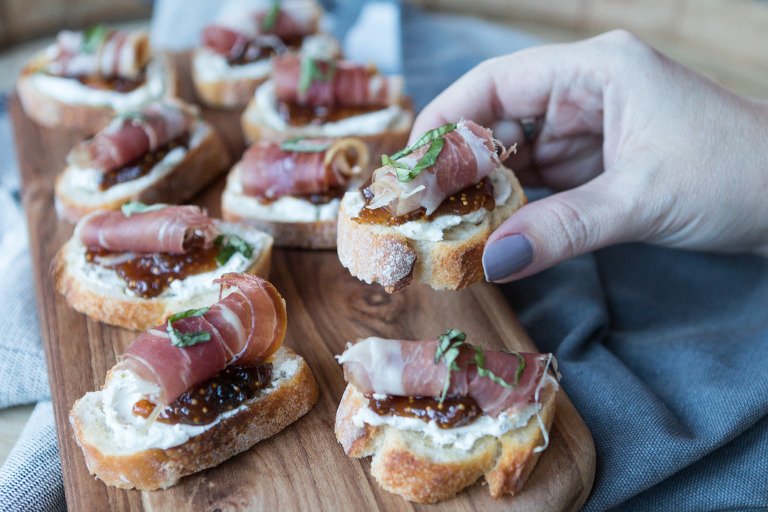 The fig jam is insanely delicious with the prosciutto and the creaminess of the goat cheese pairs perfectly with the crunchy crostinis. They’re not quite small enough for a one-biter but they’re easy enough to eat at a party and not look like a complete oaf eating them. They also look so much more difficult and fancy than they actually are. Everyone wants that, right? And the colors?!! it’s like they were made for Christmas! Slice your baguette into 1 inch slices (see photo in post). Place them on a baking sheet and brush with olive oil. Toast for 7-8 minutes. Spread the baked crostinis with the goat cheese, followed a small dollop of the fig jam (you will have extra fig jam leftover). Pull apart pieces of the prosciutto until you have pieces that are around 2 inches x 4-5 inches long. Roll the prosciutto and place on top of the fig jam. (see photos in post). Arrange on a festive platter or cheese board etc and enjoy! This flavored herbed goat cheese is Sooooo good and I find that it pairs better with the recipe than just regular goat cheese. If you cannot find this brand or another herbed goat cheese similar to garlic and herb, etc etc, you can always use regular goat cheese also. This only makes about 20 crostinis, so for a large party, I would double this recipe. 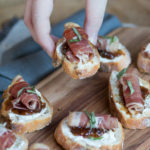 You will NOT need to buy double the fig jam or basil but you will need an extra baguette, goat cheese and prosciutto slices.